February 2011 Daring Bakers’ challenge was hosted by Mallory from A Sofa in the Kitchen. 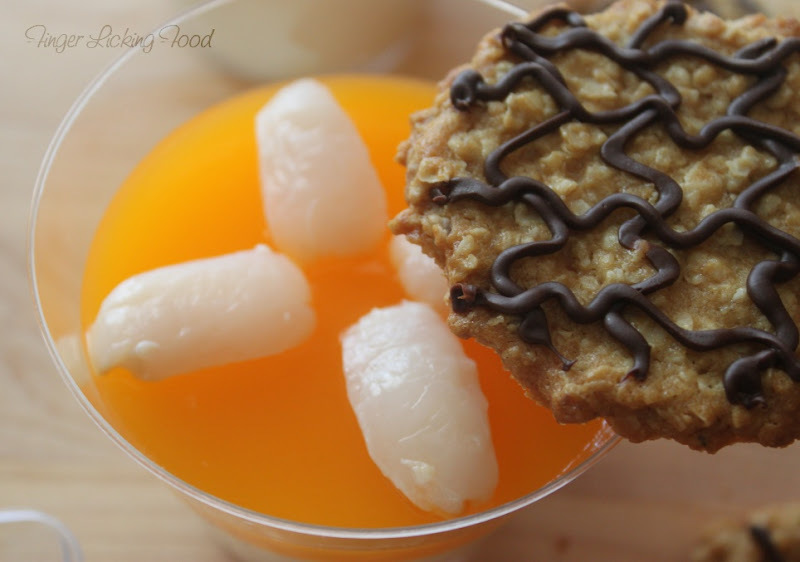 She chose to challenge everyone to make Panna Cotta from Giada De Laurentiis' recipe and Nestle Florentine Cookies. I've made Panna Cotta before and honestly if you've never had Panna cotta, one bite will have you hooked. This creamy Italian dessert is traditionally made with unflavored gelatin which is the setting agent. I chose to use Agar- Agar or 'China Grass' as its known back in India. 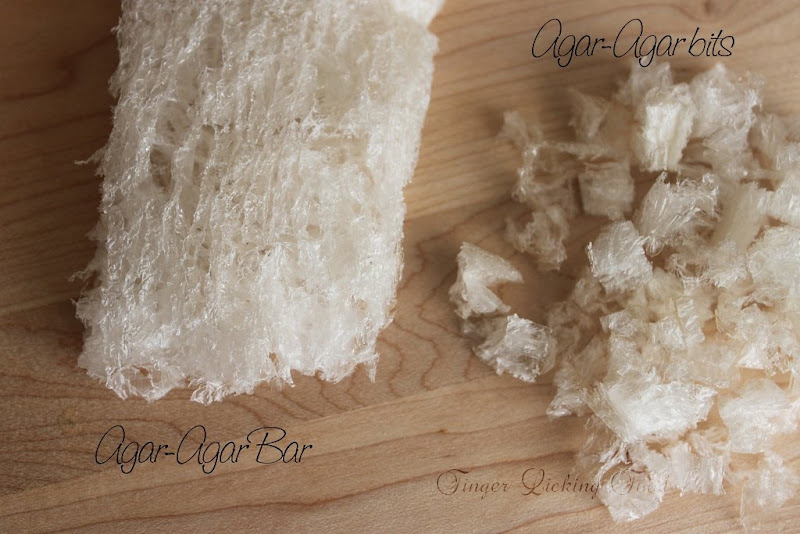 Agar-Agar is the vegetarian substitute for Gelatin. The basic challenge recipe is for Vanilla Panna Cotta, I added lychee juice to make a Lychee Panna Cotta with a colored Lychee Gelee. 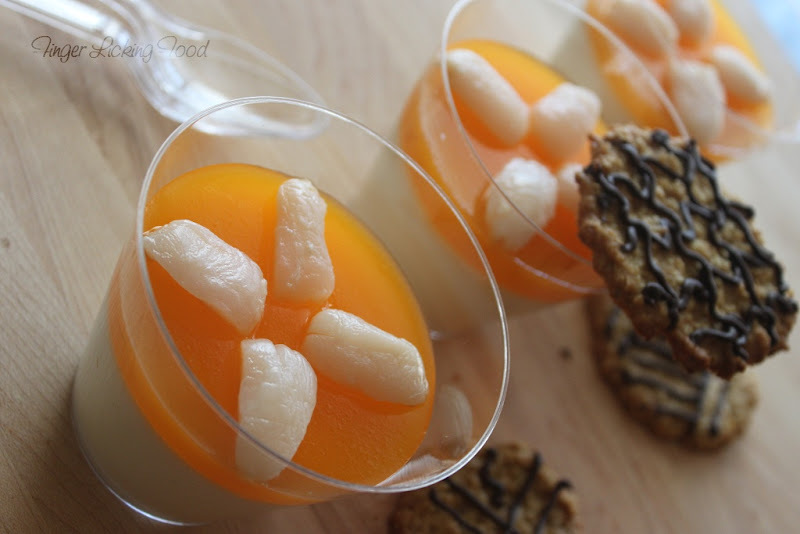 Recipe Source: Giada De Laurentiis' Panna Cotta. It's well reviewed, simple and delicious. Variations allowed: If the vanilla does not appeal to you, I am also giving you a recipe for chocolate Panna Cotta. You have a choice between the two. However, the vanilla can be modified, I generally add vanilla bean, you could also add a bit of matcha (powdered green tea), or fruit. Speaking of fruit, I'm going to give you one recipe for strawberry, and another for coffee gelée, essentially homemade Jell-o. Gelée can be poured on the bottom, top, or layered in with your Panna Cotta (though it takes a few extra steps to do this). So make the vanilla or chocolate recipe, but feel free to play with this it. I just want you to start with a base recipe. What you top it with, or garnish with is also up to you. Have fun, and get creative. In regards to the cookie, if you want to add nuts, or use a different chocolate, go for it. 1. Dissolve the agar-agar in the hot water, takes about 5-6 minutes. Then bring this to a boil on medium heat until the agar-agar completely dissolves. While the agar-agar dissolves, prepare the cream mixture as it is important that all ingredients are warm before adding the agar-agar. 2. Reserve 6 lychees from the can and puree the rest with the syrup in a food processor until smooth. Pour into a fine mesh strainer to extract the lychee juice. Discard pulp. You should have about two cups of lychee juice. Save one cup for later use in the gelee. 3. Combine the milk,cream, lychee juice, honey, sugar, and pinch of salt. Bring upto heat,making sure the mixture doesn't boil, continue to heat and stir occasionally until the sugar and honey have dissolved 5-7 minutes. Now stir in the dissolved agar-agar. 5. 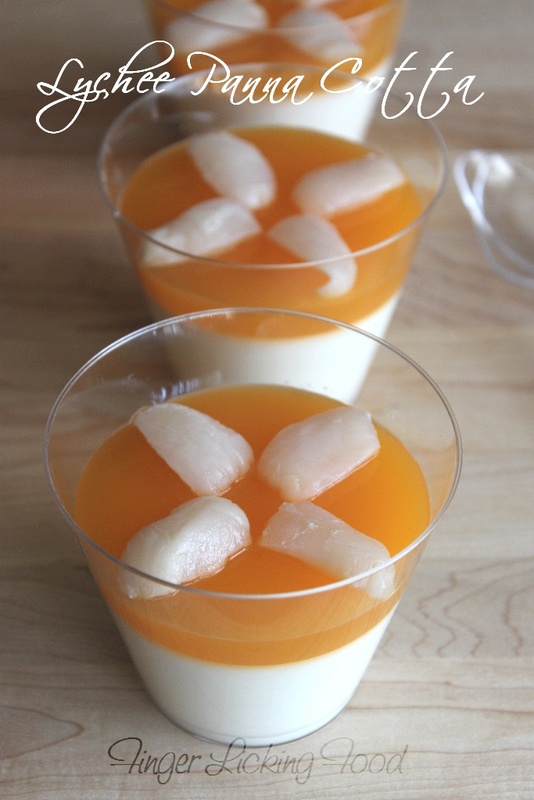 Refrigerate at least 2-3 hours before layering with the lychee gelee. 6. For the Gelee, dissolve agar-agar in the hot water. Bring upto heat until agar-agar dissolves completely. Warm the lychee juice before adding it to the agar-agar. Add yellow food color. Allow to cool for 3-4 minutes before spooning into panna cotta glasses. Allow to set for 4 hours. Garnish with reserves lychees cut into pieces. These cookies are incredibly sweet; I cut back on the sugar by half. 4. 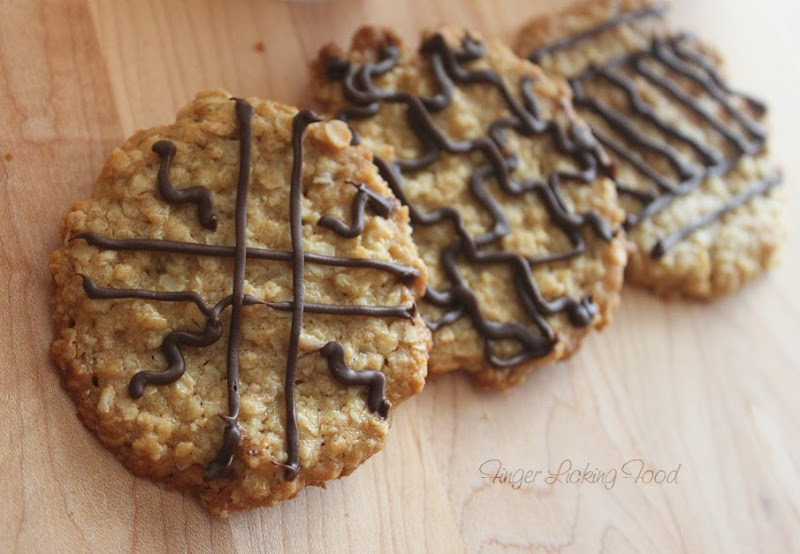 While the cookies are cooling melt your chocolate until smooth either in the microwave (1 1/2 minutes), or stovetop (in a double boiler, or a bowl that fits atop a saucepan filled with a bit of water, being sure the water doesn't touch the bottom of the bowl). i just love your presentation...so neat and beautiful and of course the food you have cooked...wow! You really are very talented and i like your blog very much. Both looks out of the world..
Love the idea of the lychees,looks so so good. Lovely and inviting,loved your presentation dear. 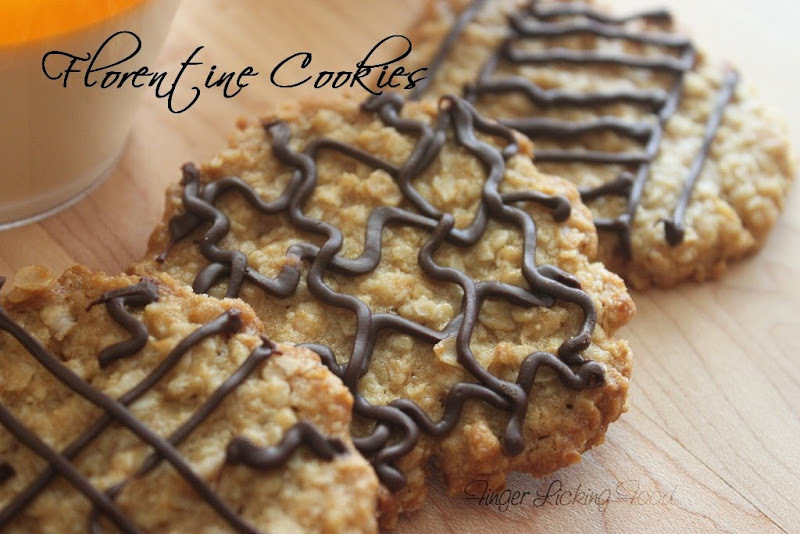 You're florentine cookies look BEAUTIFUL! I love your delicate touch with the chocolate. Very pretty. 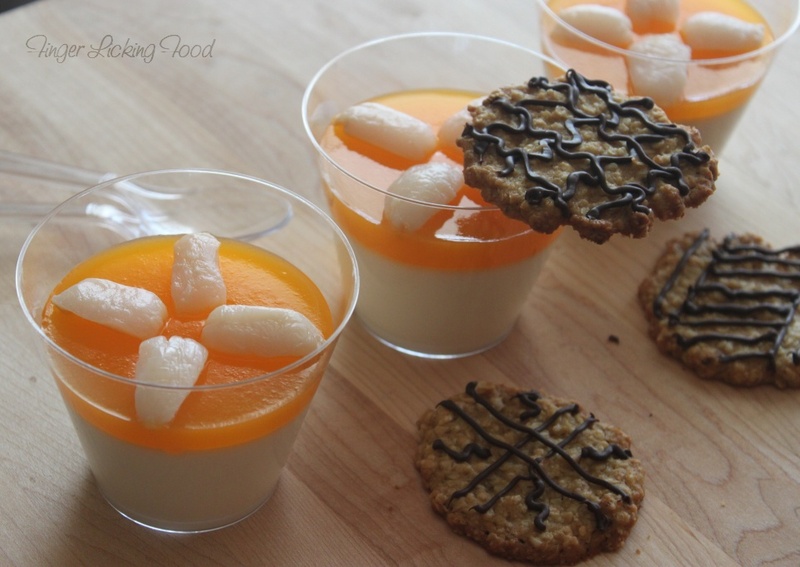 Wow lychee panna cotta looks delicious and your florentine cookies are perfect! Love that you described gelee as homemade Jello. Your lychees layer is so pretty and sounds so exotic. Lovely presentation. I have never used agar agar before. I hope I get it in the local grocery store here. Did you cut back on the sugar as listed, using half a cup, or had you already cut back when you gave the recipe? Nilo, the recipe provided is as is; I used 1/2 cup sugar instead of the 1 cup stated in the recipe.